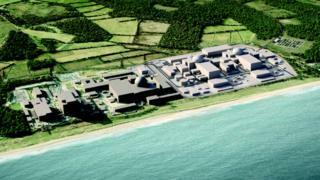 Two villages could be bypassed under plans for a new nuclear power plant. EDF Energy has started its third and final consultation on its vision for Sizewell C on the Suffolk coast. The proposals include a bypass around Stratford St Andrew and Farnham, and also either a new road off the A12, or a new rail route off the Saxmundham to Leiston line. The £16bn plant would be built next to the existing Sizewell B reactor, with construction expected to start in 2022. Under the newly-released detailed plans, there is a "road-led" option and a "rail-led" alternative. Rail would provide direct access to the main site for five trains a day, EDF Energy said. There would also be a road bypassing Theberton. A road would link the A12 at Yoxford to the B1122 east of Theberton. Both proposals include bypassing Farnham and Stratford St Andrew on the A12, although Suffolk County Council wants a four-village bypass to also take traffic away from Marlesford and Glemham. There would be park-and-ride sites at Darsham and Wickham Market. EDF Energy has also reduced the size and height of a proposed accommodation campus for workers, and said it had "taken note of the concerns from local residents". Debbi Taylor, clerk for Farnham with Stratford St Andrew Parish Council, said the two-village bypass was the "absolute bare minimum". She said people and houses have been hit by lorries, walls have been knocked down and it "doesn't just affect the quality of life of people who live here, it affects the people travelling through". The RSPB said the proposed power plant had the potential to "significantly impact" wildlife and visitors at its Minsmere nature reserve, which is less than six miles (9.6km) north of Sizewell. It urged EDF Energy to publish a "clear plan" outlining how the company would "address any potential harm". Marjorie Barnes, spokeswoman for EDF, said "wildlife in the Sizewell area has flourished on EDF Energy land under the good stewardship of Sizewell B, in partnership with Suffolk Wildlife Trust" and it was continuing to consult with wildlife groups in the wider area. The energy firm has been awarded a Biodiversity Benchmark by The Wildlife Trusts umbrella organisation, with Sizewell providing habitats for otters, water voles, birds and invertebrates. The company said it planned to replicate Hinkley Point C, the new nuclear power station it is building with China General Nuclear (CGN) in Somerset. It said: "All the lessons we learn at Hinkley are being automatically transferred to Sizewell". Project development director Jim Crawford said it meant there would be "risk reduction", "schedule improvement" and "cost reduction". Exhibitions, detailing the plans, will take place in 14 towns and villages over the next three weeks. The consultation runs until 29 March.